The three candidates for Maine governor faced-off in the first of five debates Wednesday morning. Republican incumbent Paul LePage, Democratic U.S. Representative Mike Michaud and independent businessman Eliot Cutler disagreed on how to improve higher education, energy costs, health care and Maine's troubled economy. With no opportunity for rebuttal, the fireworks were kept to a minimum, but the candidates all got in a few jabs. The scheduled mill closings in Millinocket, Old Town and Bucksport took center stage. More Out-of-State Money in Maine Gov. Race? "Three weeks before Christmas, 500 workers in Bucksport will join 600 other paper workers who lost jobs in 2014." Eliot Cutler admonished LePage to take care of those workers. "I hope you use discretionary funds to get them heating oil this winter," Cutler said turning the Governor. Congressman Mike Michaud said the Governor has failed to lead Maine out of economic hardship. "There's one person holding us back. 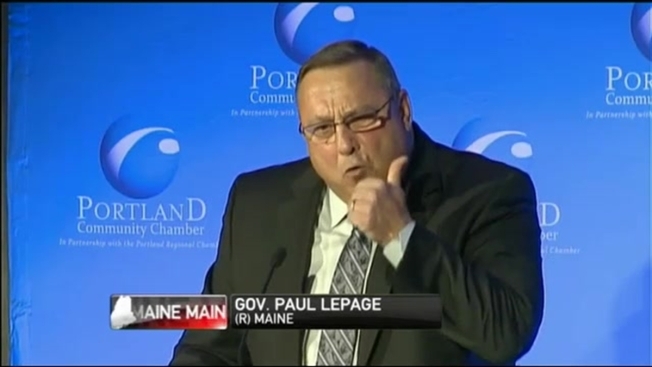 That's LePage," said Michaud. "He never had a plan. He has no plan." But the governor held his ground, pointing to accomplishments in his first term. "I've reduced taxes and we're reforming welfare because money doesn't solve poverty. Education does," LePage said. Also from Governor LePage was a rare admission that he may have been too blunt at times in his first two years in office. "Even a Frenchman can be taught to cool down," he said, drawing laughs from the audience at the Portland Chamber of Commerce monthly breakfast meeting. Citing the governor's unwillingness to work with other New England's Governors on energy issues, Michaud touted his own bipartisan efforts. "I'm the only candidate that has a track record of working across the aisle to get things done," Michaud said. "Mike, you've worked across aisles, but you've never created a job ever or managed a business," Cutler rebutted. The debate brought the highest attendance Portland's Chamber of Commerce has ever had at and "Eggs and Issues" breakfast. Compared to four years ago, fewer absentee ballots have been requested and returned, an indication that Mainers are paying attention to what's being said during these debates and waiting to make their decisions.